Lucky mum Eileen Allan felt ready to melt – when she took a surprise delivery of a luxury box of chocolates and a bouquet of flowers. The unexpected gift was handed over after she was nominated by daughter Suzanne as Scotland’s most deserving mother. Logistics experts Eagle Couriers celebrated 30 years of business by asking customers to name mums who deserved a “special delivery”. 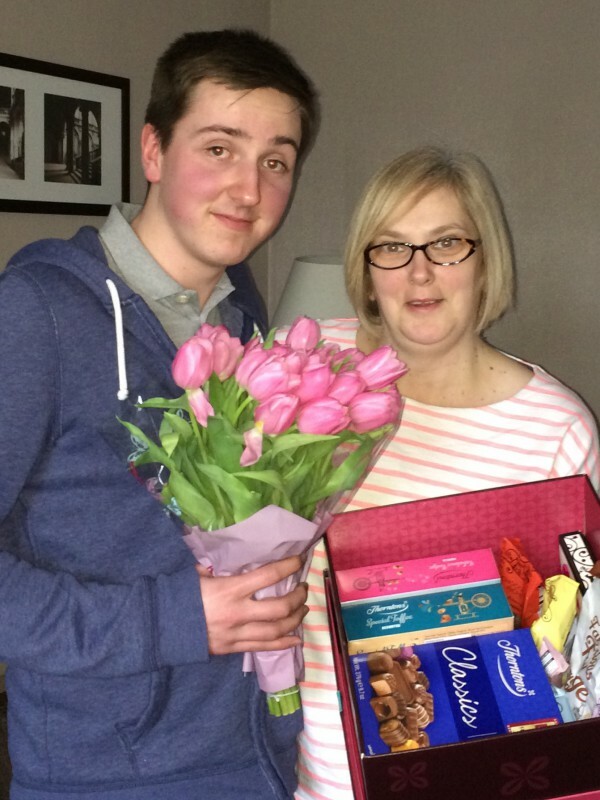 Stunned Eileen, from Dollar in Clackmannanshire, received luxury Thornton’s chocolates and a beautiful bunch of flowers, following success in Eagle Couriers’ competition, which saw the company celebrate its 30th anniversary in the same week as Mother’s Day. Throughout March, Scotland’s largest independent courier encouraged sons and daughters across Scotland to nominate their beloved mums, with 30 getting a special delivery. While 29 received flowers and chocolates delivered to their door, the overall winner also got a bumper luxury Thornton’s hamper. Fiona Deas, director at Eagle Couriers said: “We were staggered at the response we got from the people of Scotland – who clearly want to show their mums just how much they mean. “The response was incredible and it was so difficult to choose the winners, but Suzanne’s entry tugged at the heart-strings and it is clear his mum is very deserving. Eagle Couriers celebrated its 30th anniversary on 11th March 2015 and has bases in Edinburgh, Glasgow and its HQ in Bathgate, West Lothian. It has a 3500-strong client base including the BBC and the NHS, public sector organisations and sole traders. As business-to-business experts, Eagle Couriers help other firms operate more efficiently and profitably by safely delivering on time everything from documents, medical samples and engine parts to sports footage, scripts and TV props.